Ever been stuck in motorway traffic which seems to have no reason? A model for traffic flow explains why. by Chalkdust. Published on 13 March 2016. Have you ever reached the start of a traffic jam fearing the worst—road works, an accident, a fallen tree—to later discover no clear reason for the delay? Then you fell victim to one of the strangest traffic phenomena: the phantom traffic jam. This ghostly foe may seem supernatural, but can actually be predicted through the theory of shockwaves. 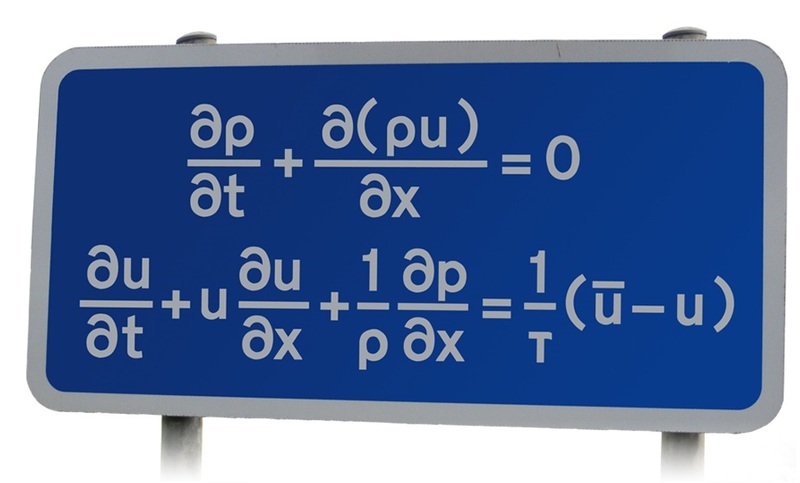 We can model traffic by treating it as a compressible fluid, the equations for which are above. In this case, x is the distance along a road (of infinite length), ρ is the density of cars at any given point and u(x)is the speed. A car braking a little too hard somewhere will result in a small decrease in the steady state solution, where all cars are travelling at the same speed ū and the traffic density is constant. The car behind then has to brake slightly, as does the car behind that , and the one behind that, and so on, resulting in a soliton-like wave—aptly named a jamiton—travelling backwards along the road at a speed of around 12 mph (as calculated by traffic monitoring agencies). Ride a phantom parabola into our latest issue. Billiards, maths, tiles, mistakes, plus all your favourite regulars.